How are we expected to give our clients the best rebrand possible if we don’t know what it is like to do a complete make-over ourselves? We decided it was time to take our website to the next level and in doing so, we experienced first hand what our clients go through on a regular basis. Through rebranding with WordPress, we learned a lot about how to help clients in the future. Getting a new web presence can be stressful, tiring, and nerve-racking. That being said, it can also be really exciting, a great opportunity, and a fun experience. At The Web Development Group we had periods of stress and indecision while redesigning our site, but that’s to be expected, it’s a big undertaking. Fortunately, we are confident in our designers and we know that we have an amazing group of developers who are able to take our vision and turn it into a reality. As a team, we met to talk over what we see the purpose of our website to be, and what personality we want our brand to take. After thinking over what we do, who we work with, and the trajectory that WDG is headed, we decided we wanted our custom WordPress site to represent our team. 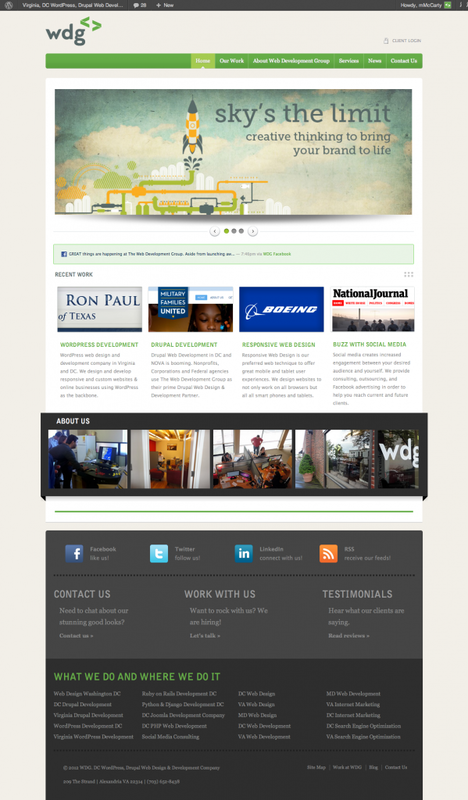 While exploring our new site, you will notice that it is creative, fun, and professional. In many ways, this website is us. Our Virginia web design team did an amazing job at incorporating images of our team, thinking up creative headlines, and transforming our visions into the perfect site for us. Developmentally speaking, this site is top of the line. Our team of DC WordPress developers have built a countless number of sites so they seem to have a surplus of tricks and knowledge up their sleeves. Whenever a feature was thought of that we wanted on the new site, one of our developers was quick to throw out a few WordPress plug-ins that would be perfect. That’s what’s so nice about working with The Web Development Group, we have become masters of all things WordPress and Drupal related. The launch of our new site comes out during one of the most exciting times for WDG. We are not only finishing up a huge rebranding this week, but our first ever GiveBack DC this past weekend was a huge success! This was our chance to give back to the local community. As you have probably heard by now, GiveBack DC is a rebranding sprint for three local nonprofits. The chosen organizations received a new web presence in under 72 hours. Looking towards the future, we feel very fortunate to have been able to go through this period of rebranding. We now have first hand knowledge of what our clients go through while they rebrand. We are eager to take this knowledge and apply it to future projects. If you are considering getting a new web presence, we encourage you to reach out to us. WDG is located in northern Virginia and is one of the top providers of custom designed Drupal and WordPress sites for the area. Of course, we also work with businesses in and around DC, Maryland, and North Carolina. How do you think our new site compares to our old? We look forward to hearing feedback from everyone, so let us know what you think! What would you have done differently? What’s your favorite feature?